The school year is in full swing on the University of West Alabama campus, and that not only means test prep, projects and papers, but also a calendar full of fun and engaging events to keep students, faculty and the community entertained. Football, 5K’s and festivals dominate the fall schedule on UWA’s campus, as seasonal traditions continue to contribute to what we know and love about autumn. Check out these UWA campus events happening in September 2017! What: Alpha Kappa Alpha Sorority will collect donations in the form of backpacks and school supplies that will be distributed to youths in need. What: Travel with the UWA Tigers as they take on the Samford University Bulldogs at Samford University in Birmingham. What: Join Alpha Kappa Alpha for a candlelight vigil in honor of World Suicide Prevention Day, which is Sept. 10. Lighting a candle serves to show support for suicide prevention, to remember lost loved ones and to recognize suicide survivors. What: Miss University of West Alabama invites you to gather to watch the finals of the Miss America 2017 competition airing at 8 p.m. CT on ABC. What: Grab two buddies with soccer skills and participate in a friendly 3v3 tournament at UWA’s intramural fields . What: The Sumter County Fine Arts Council and UWA kick off the season with a performance from the Zuzu African Acrobats. Based in Mombassa, Kenya, the acrobats have performed in more than 25 countries in the past 10 years. What: Hosted by the Kappa Xi Chapter of Phi Mu, this 5K run/walk serves to raise money for cystic fibrosis. What: Cheer on the UWA Tigers as they take on the Mississippi College Choctaws at Tiger Stadium for the first home game of the season. What: This three-day event serves to will connect attendees with the history of Alabama’s Black Belt region and encourage community members to plan for a life-enriching future in the area. The event will feature several informative guest speakers. Read more about DIRT 17 here! Where/When: Click here for updates on the program agenda. What: Get the info you need to know to participate in the Miss UWA Pageant, which will be held in Bibb Graves Auditorium on Nov. 9, 2017. What: Meet potential employers and register for door prizes at the Career Services Career Expo at Bell Conference Center. Business attire is expected, and resumes are recommended. What: Put your disc golf skills and compete against other disc golf enthusiasts on UWA’s Tiger Trails Disc Golf Course. What: The UWA Band program features four ensembles that perform on a regular basis on and off campus: The “Scarlet Band from Tiger Land” Marching Band, The “Side-Court Posse,” the symphonic band and the jazz band. What: Travel with the UWA Tigers as they take on the University of West Alabama Lions at UWA in Florence. What: Participants have the opportunity to show off their punt, pass and/or kicking skills for a shot to make it into the NFL National Punt, Pass and Kick finals. What: Active Minds is a national organization supporting a network of campus-based chapters led by students pushing for mental health advocacy and education. Join the UWA Active Minds chapter for an open mic session in the Tiger’s Den. What: Cheer on the UWA Tigers as they take on the Shorter Hawks at Tiger Stadium for the second home game of the season. 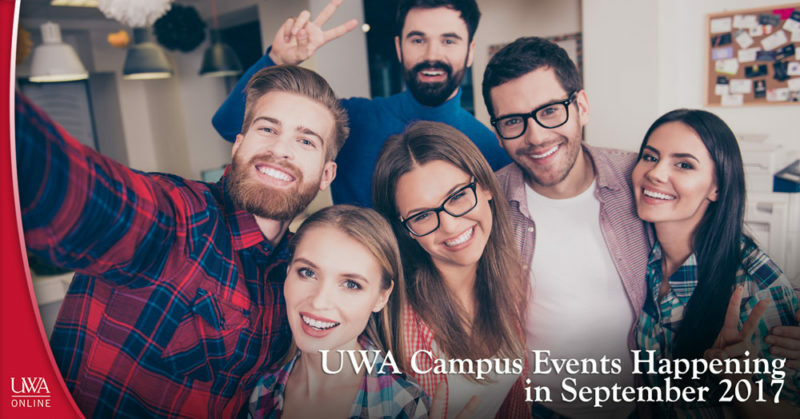 Know someone who would be interested in any or all of these UWA campus events happening in September 2017? We encourage you to share this list on your social media channels! Keep in touch with the UWA community and the world of continuing education through the UWA Online Continuing Education blog! To see what we have to offer in terms of continuing education, visit us at www.uwa.edu/ce! Posted on September 3, 2017 , updated on August 30, 2017 · This entry was posted in Events, UWA and tagged events, UWA, UWA campus events happening in September 2017, UWA Online. Bookmark the permalink.